In this tutorial, we will design a system to read the RFID cards using STM32 and RFID Reader. RFID stands for Radio Frequency Identification which reads information by using radio frequencies. RFID’s are used in many authentication systems like elevator parking system, automated toll collection, maintaining patient information in hospitals, automated data collection etc. Before interfacing RFID with STM32, first we will learn about RFID tags and RFID reader. RFID tags are made up of a microchip with a coiled antenna that can communicate with a nearby reader wirelessly. Different kind of RFID tags with a different kind of shapes and sizes are available in the market. Few of them use different frequency for communication purpose. 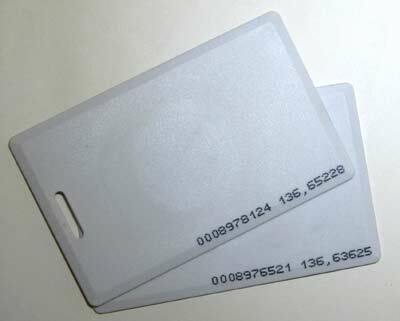 We will use 125Khz Passive RFID cards which holds the unique ID data. You can observe a coil and a microchip present inside the tag when you place a RFID tag in front of a bright light. Passive RFID tags draw power from the magnetic field that was created by the reader module like EM-18 and use it to power the microchip’s circuits. The chip then sends information to the reader. Active RFID tags requires separate power supply and contain up to 1MB of read/write memory. EM-18 RFID reader has nine pins. Among nine pins, 2 pins are not connected, so we basically have to consider seven terminals. The table below shows Pin description of EM-18. 1. First, include LCD display library for using LCD display functions. Then define LCD pins and initialize the LCD display. To know more about interfacing LCD with STM32F103C8 follow the link. We need to set the LCD display mode as 16x2 and start serial communication at baud rate 9600 with the pin PA10 (This is the SERIAL1 Communication port RX1 of the STM32F103C8 which is connected with the EM-18 TX pin. 3. Next display welcome message and clear after some time. 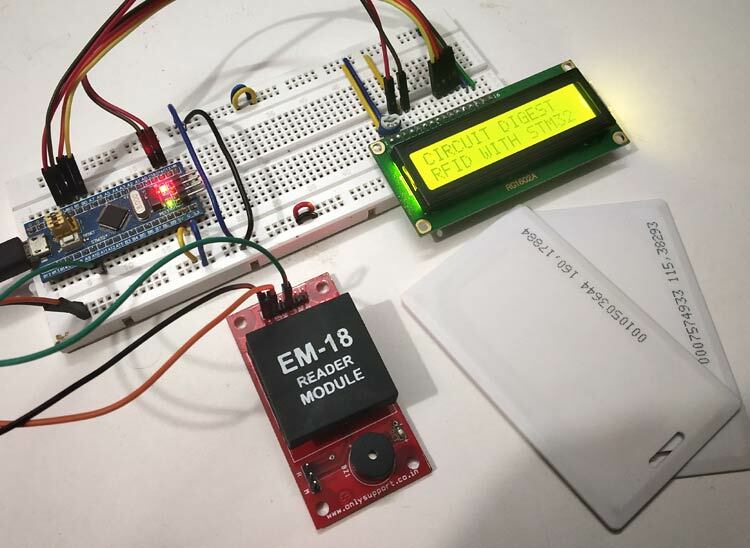 Once the data from EM-18 RFID Reader Module (Tag ID) is available at the serial pin of STM32F103C8 the character is stored bit by bit and displayed one by one on LCD display. Now just upload the complete code in STM32 and your system is ready to work. Just place any RFID tag over RFID reader and you will see the Tag ID appearing on the 16x2 LCD display. Complete code and Demonstration Video for using RFID with STM32 microcontroller are given below.